Boxes and cartons and cans, oh my! These wines travel with you. The selection of wine packaged in material other than glass continues to grow. Pours in aluminum cans have joined the ranks of cartons and bag-in-box formats. Winemakers are quite pleased, even if they are sometimes surprised by who is purchasing them. At a recent wine tasting, Ryan Harms was pouring samples when a woman in her 70s approached his table. “I assumed she would have no interest in the can,” recalls the owner-winemaker of Union Wine Co., referring to his Underwood brand of Oregon wines, now offered in cans. “She got up to me at the table, turned to her friend, and said, ‘We need these for the golf course!’” he says. Age matters little when it comes to seeing the advantages of pours in durable, lighter containers. That customer is in good company. Nielsen research indicates that sales of bag-in-box wines (3-liters and under) and Tetra Pak carton wines have both seen double-digit-percentage growth since last year. Wines in aluminum cans are also making a push into the market. While these packaging formats represent just over 5 percent of all wine sold in the US, they are a trend to watch. Consumers like how these formats provide more for their money. A 3-liter box retailing for $20 holds the volume of four 750-milliliter bottles, the equivalent of just $5 per bottle. Producers tout the environmental advantages of lighter packages (they require less fuel to ship than glass bottles) and recyclability is also important. When researching alternatives, Harms learned that once an aluminum beverage can enters the recycling stream, it only takes a 60-day turnaround to be back on the shelf. When customers ask if his canned wines taste tinny, Harms assures them that the food-grade lining that separates the liquid from the aluminum prevents a metallic taste. Just as consumers now know that bag-in-box wines don’t taste like plastic, they will learn through experience that canned versions taste like wine, not the package. While other-than-glass containers are designed to be durable, they are not impervious to heat. Cartons seem especially sensitive to high temperatures. We encountered a couple off the shelf that tasted cooked. Any number of things could have happened along the supply chain. Still, don’t hesitate to ask your retailer if products on the shelf are recent arrivals, and avoid containers that bulge. As with glass, keep these pours cool — even if your outdoor adventure is just a short hike to the patio table. Union Wine Co., Underwood Sparkling A bubbly chardonnay with white peach, lime zest, and a whiff of chalky minerality. Offers bright acidity along with bubbles created through carbonation. Underwood Rosé This copper-hued pour is crafted from a kitchen-sink array of grapes including pinot gris. Tart and lively with appetizing notes of saline and stone-fruit skin bitterness. Around $8 for a 375-milliliter aluminum can. At Downtown Wine & Spirits, Somerville, 617-625-7777; The Wine Press, Brookline, 617-277-7020. 2014 Fuori Strada “Off Road” Grillo Scents of dried pear with a little initial funk on the nose. A Sicilian white with moderate acid, delightful apple flavors, and some weight on the palate. Around $15 for 1-liter carton. At Shubie’s, Marblehead, 781-631-0149; Wine & Cheese Cask, Somerville, 617-623-8656. 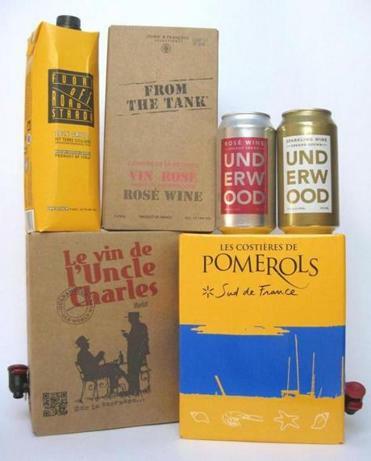 Les Costieres de Pomerols “Sud de France” The school bus yellow box with the royal blue stripe houses the same white as a 2015 Domaine Saint-Peyre Picpoul de Pinet, from a cooperative in southern France’s Languedoc. Waterfall fresh with florality and crunchy white peach. Around $26 for a 3-liter bag-in-box. At Cambridge Wine & Spirits, Cambridge, 617-864-7171; Dave’s Fresh Pasta, Somerville, 617-623-0867. Jenny & François Selections, Domaine de la Patience “From the Tank” Vin Rosé This delightful grenache-syrah sipper from southern France suggests peach skin and mineral, leading to a palate of stone fruit, green apple, and lemon spritz. Around $30 for a 3-liter bag-in-box. At Dave’s Fresh Pasta; Central Bottle Wine + Provisions, Cambridge, 617-225-0040. Le Vin de l’Uncle Charles Merlot This southern French red calls out for barbecued ribs. Plentiful ripe tannins in a dense, juicy package of dark, ripe berries. Around $20 for 3-liter bag-in-box. At Colonial Spirits, Acton, 978-263-7775; Blanchards Wines & Spirits, Jamaica Plain, 617-522-9300.